I tried al versions of the lorawan mac( 1.00 till 1.1) but my device only sends an JoinRequest. The device (TTGO ESP32 with wifi + LoRa) is only waiting for joining. You need to figure out where the process is failing. Are join accepts being transmitted but not acted on? First add logging in the node to figure out if they are being received (if not could be an air settings issue especially with downlink channel mapping or a firmware timing issue). The join request packets are being received in the gateway screen of the server. The DEVEUI in MSB format gave an MICFailed error. So i changed that to LSB. Now i try to change the other key’s. Anyone a hint what’s wrong? I have an JoinRequest and an JoinAccept, but no data in my application. Does anyone know why i see the frequency 1210132480 while i send on 868100000…? Did you find any solution for this problem? i am also experiencing the same issue. I am using ESP Lora WiFi 32 as end node with OTAA. Gateway is receiving join requests and it is also sending Join accepts but device is not joined and device data is still not received. 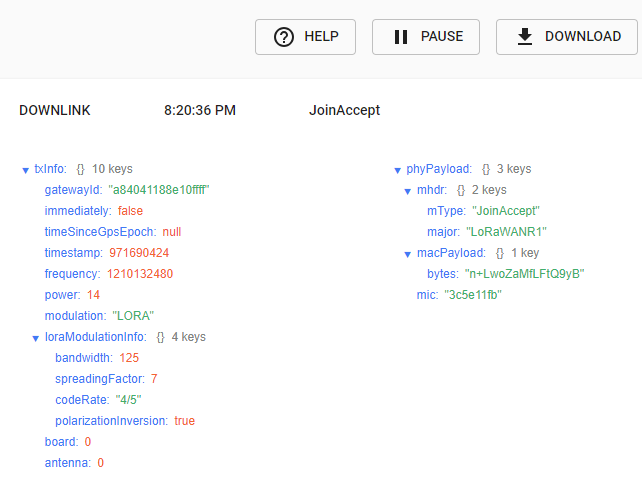 The server might have sent a join accept, but has the node actually heard it? 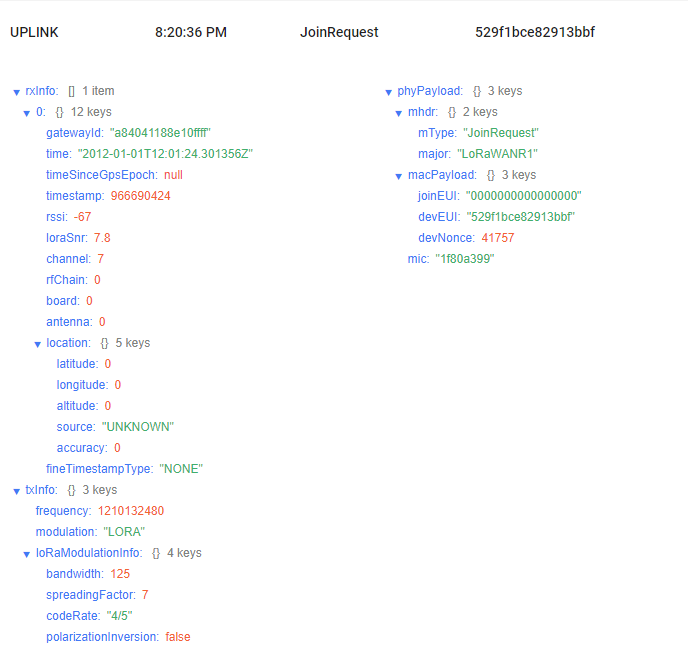 Have you tried configuring the node as ABP and seeing if downlink messages are received? I’ve been having issues with on a heltec WiFi lora board where after some time downlink packets are not received. I think it may be LMIC (I assume that’s what you’re using) just not keeping the Rx window open long enough. Thank you for the reply. Currently i am using OTAA from ESP32 Lorawan library. I tried to use LMIC but i am not receiving anything i-e Join Request and Join Accept. As i am working on 433 MHz thereby i was using the forked LMIC library from louie. As you worked on LMIC Library, do i need to make some changes in the code? 433 is a bit unusual. First thing you should probably check is that the server and the node agree on how uplink channels map to downlink channels. You should probably do is put some serial logging in your node firmware so it tells you what it is doing in each receive window (frequency, spreading factor, etc), if it found any raw packet, and if that decoded or failed to. Thank you for the reply. I am using two different frequencies. For node, Tx is 433.375MHz and Rx 434.665MHz. Gateway is set to Tx at 434.665MHz. Whenever i change this frequency, gateway does not send join, it means that it matches the frequency with node and node monitor is also showing that it is receiving at 434.665MHz but still there is no joined session and keep looping between join request and join accept. I am using ESP32 Lorawan library for Wifi lora 32 as end node and dragino lg01-p (single channel) as gateway. Device activation is by OTAA.